Historical parallels are never exact. But, they are often eerily similar to one another in circumstances and outcomes. Let’s have a look at the parallels between Scientific Management 100 years ago and Toyota Management (combination of Toyota Production System and The Toyota Way) today. Frederick Winslow Taylor is acknowledged as the creator of Scientific Management. But he did not do his revolutionary work alone. There were others who worked closely with him and had important roles to play, including Carl Barth, Morris Cooke, Henry Gantt, and Horace Hathaway. Others worked with Taylor and also did their own unique work contemporaneously such as Frank and Lillian Gilbreth. This was a cadre of several men and one woman who set out to make change for the better. Along with Taylor were some academics, working in the new field of industrial administration. These included Horace Drury, Henry Farquhar, Harlow Person, and C. Bertrand Thompson. As might be expected, some academics studied the Scientific Management closely and some also had some actual work experience. As a result, they were able to understand the technical, human, business, and economic intent of Scientific Management. Other academics lacked hands-on work experience were critical of Scientific Management (especially those academics after World War II, primarily due to terrible ex-post facto analyses). Scientific Management, also known as “The Taylor System” was a fragile system of management. It could only be applied in its entirety, in a precise way, in order to assure its success. Under the skilled care of Taylor and his associates, many manufacturing and some service organizations succeeded in achieving the major aims of the Scientific Management, which was to increase output and profits for the business, increase productivity, reduce costs, simplify work, and substantially increase the pay of workers. To achieve that result, Taylor’s associates adhered at all four of Taylor’s principles and the many associated practices, and they worked hard to ensure that the management of the organization they worked in were fully committed in order to achieve good results and avoid negative backlash or failure. Taylor and his associates had disdain for efficiency engineers and the efficiency movement because Scientific Management was much more than just efficiency, worthy as that is. Its objectives were to improve the strength of American industry, eliminate disputes between labor and management, create high-quality repeatable processes, reduce costs, improve corporate profitability, improve productivity, improve working conditions, increase workers’ pay, and so on. Taylor and his associates also wanted to teach business leaders that high wages was a sure path to low costs (something that business leaders still fail to understand today), and break manager’s habit of cutting working pay in the mistaken beliefs that it reduces costs. Taylor and his associates knew that the “fakirs” and “charlatans” work would lead to poor outcomes for the company and its workers, as well as its customers. And, that was what indeed happened. Yet, efficiency engineers – some of whom were former academics or know-nothing people who had little actual business experience – became popular and far more financially successful that Taylor’s cadre of well-trained management consultants. In testimony to Congress in 1912, Taylor said: “It ceases to be scientific management the moment it is used for bad.” From experience, Taylor knew that Scientific Management must do no harm. Taylor developed his system with the expressed intent to improve management practice, not to do harm and worsen management practice. Scientific management did not harm employees, but efficiency engineers and the efficiency movement did. That is because the efficiency engineers did not care about and did not “install” Scientific Management. They installed other things – dilutions of Scientific Management – that invariably led to layoffs and other short-term gains for their clients. Was Taylor the perfect person, with perfect thinking, perfect language, perfect views of people or how to improve? No. Did he create the perfect management system? No. But, his thinking and his work must be understood in the context of the times in which he lived (sellers’ market) and in the 25 years after he passed away (in 1915). His work – the creation of industrial engineering – had a profound influence on the development of Toyota’s production system and overall management practice. In the early 1970s, soon after the oil shocks, people both inside and outside of Japan stated to become aware of Toyota’s production system (TPS) and began to study it. Some wonderful work was done by Kiyoshi Suzaki, Richard Schonberger, Yasuhiro Monden, Robert Hall, Masaaki Imai, and others. The books and papers they wrote generated a lot of interest in Toyota’s production methods. It is noteworthy that most – but not all – of the early study of TPS was its technical aspects, not its human aspects. When the human aspects were described, it was usually both limited in scope and brief in explanation. Taiichi Ohno is acknowledged as the creator of Toyota’s production system. He too did not do his revolutionary work alone. There were many others who worked closely with him and had important roles to play, including Yukio Arima, Kikuo Suzumura, Fujio Cho, Chihiro Nakao. While Taylor’s approach to improvement was more purely engineering-based, Ohno-san’s approach to improvement was different. It was a combination of engineer (science-based) and mechanic – i.e. trial-and-error. The Toyota’s production system’s principles, Just-in-Time and autonomation (Jidoka), were extensively studied and presented in books, conference presentations, and so on. Yet, consultants and managers would “implement” (not “install”) only Just-In-Time and forget about autonomation and everything else that made TPS function correctly. They wanted the cost savings that would result from pushing their massive inventories upstream to suppliers, but without making any fundamental changes to their own processes. Kanban became something of interest as well, though largely separated from the rest of TPS. From the late 1970s through the late 1980s, a small army of consultants sold business leaders on JIT, kanban, and other “tools” of TPS. There was a ready market for that in the United States and elsewhere as global competition began to intensify in certain industries. Ohno-san and his cadre of Toyota associates must have viewed the consultants as “fakirs” and “charlatans.” But this bad situation was soon to get much worse. In the mid-1980s, researchers at the Massachusetts Institute of Technology begin to study Toyota’s Production System. To a great extent, the study of TPS was performed by academics, though some of the graduate students had industry experience. In 1988, the term “Lean production” is presented to the world as a synonymous (or generic) term for Toyota’s production system. TPS was understood narrowly as a “production system,” not as an overall management system as Ohno-san had thought it to be. So TPS was seen as beneficial for operations, but not for any other parts of the business – purchasing, IT, human resources, engineering, etc. Yet, fundamentally, TPS was Toyota’s management system. In addition, TPS, the creation of which is suffused with Japanese thinking and context, is studied by English speaking people (there were some exceptions; e.g. Takahiro Fujimoto, Toshihiro Nishiguchi). As a result, researchers are certain to miss many important nuances and details. And indeed they did. That, in turn, that led to major problems with Lean transformations. Contrast that with Scientific Management, where there were no translation problems. Yet, people still had great difficulty understanding it. And the “fakirs” and “charlatans” were ever-present then, as now. Soon, the term “continuous improvement engineer” became common and the “Lean movement” was born. It spawned an army of consultants – a huge army of consultants – most of whom had little actual experience with TPS. They understood the technical and business aspects of TPS, but few understood the human aspects of Toyota Management. Failure to understand the human aspects led to Fake Scientific Management then, just as as it did Fake Lean management today. I am convinced that Ohno-san and his cadre of Toyota associates must have viewed Lean (in the early days) and the consultants it spawned as “fakirs” and “charlatans,” principally because various important elements were left out. In 1978, Ono said: “…those who decide to implement the Toyota production system must be fully committed. If you try to adopt only the ‘good parts’, you’ll fail” (T. Ohno in NPS: New Production System, I. Shinohara, Productivity Press, Cambridge, MA, 1988, p. 155). The view that the Lean movement, representing a severe dilution of Toyota Management, and its consultants were “fakirs” and “charlatans” likely held true at least until 2007, and perhaps even to now. Here is why. In 2001, Toyota published “The Toyota Way 2001,” in which it explicitly articulated “Continuous Improvement: and “Respect for People” as the two pillars of The Toyota Way. Toyota made explicit what had long been implicit: People are central to the achievement of continuous improvement. To that end, they must be allowed to think and given opportunities every day to contribute to making their job easier while achieving better results. The importance of respecting people – all stakeholders; employees, suppliers, customers, investors, and communities – was something that had long been apparent if one were to closely read various works written by Toyota leaders and others, including their speeches and news stories. After a lag of six or seven years, the leaders of the Lean movement finally recognized the “Respect for People” principle, something that Taylor had fought for over 100 years ago (called “cooperation” in his day). Lean practitioners began to realize that Lean transformations were failing because management did not respect people and were laying them off after improvements had been made. Not only were organizations failing to “become Lean,” few, if any, had even come close to what Toyota achieved in the 25 years after World War II. It ceases to be Lean management the moment it is used for bad. Right? Harming people does not respect people. Right? These were the same problems that plagued Scientific Management 100 years earlier. This question will forever loom over the Lean movement: Why did it take publication of “The Toyota Way 2001,” plus another six or seven years, to realize the importance of people? I believe it was a failure among the MIT researchers to accurately comprehend Scientific Management, industrial engineering, and other important facets of management history, and their thinking that TPS was something entirely different, when, in fact, Scientific Management and TPS (Toyota Management) are closely related – from both technical and human perspectives. In 2007, the term “lean production” was replaced with “Lean management.” Bravo! What took so long? The Lean movement readily adopted the term Lean management because the term Lean production had become worn out over the prior 20 years. I think there is no doubt that Ohno-san (were he alive) and his Toyota associates would have disdain for today’s continuous improvement engineers and the Lean movement because Toyota Management is about more than just continuous improvement – or wealth creation, growth, or competitive advantage – worthy as those are. Its objectives are much more expansive and also fundamental to corporate survival and deeply intertwined with people for the betterment of humanity. Spooky historical parallels are often just curiosities and of little practical consequence. In the case of progressive management, what has happened over the last 100-plus years is more than just a curiosity, and the practical consequences have been significant. Efforts made by a great many people over long periods of time to improve businesses usually result in little in the way of tangible business results. Yet, a common consequence is that employees are harmed by layoffs or suffer under bureaucratic, check-the-box Lean. Suppliers and customers often don’t fare much better either. Would knowing the true nature of Scientific Management and its challenges have made a difference in how Lean was understood by researchers and practiced by managers and employees from 1988 through today? 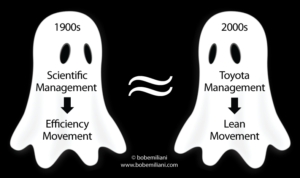 Would knowing the true nature of Toyota management earlier in the Lean movement have made a difference in how Lean was understood and practiced? Sadly, it is impossible to say, though one would certainly hope so. We know from experience that, no matter what, most business leaders are intent on pursuing shortcuts and are devoted to finding the latest tools that help them achieve short-term gains. But, it is likely that a larger number of leaders might have listened and, as a consequence, led efforts to make things better for all stakeholders: employees, suppliers, customers, investors, and communities. That would be a big improvement! they stay the same; Taylorism was subject to distortion the way Toyota management was]. What is it about humans and capitalism that consistently, willfully subverts learning by doing? I would submit that the FAKIRS and Charlatans are still with us. A book published in 1996, The Witch Doctors, Making Sense of the Management Guru’s, by Micklethwait and Wooldridge does a fairly good job although does not stand up to fact check rigor in some instances. For whatever it is worth metaphorically, Taylor laid the foundation and it was a good one because it is supporting all the subsequent work of those that Bob references in this piece.